Getting players to believe in themselves can be tough, especially during a game. That’s why confidence cleats can really help. It’s super challenging for players to keep that “one” key reminder, or phrase in their head during the chaos of a game, and shouting it out from the dugout is NOT the way to go – but Confidence Cleats are! No matter what position they play, all players need an anchor, or reminder to some type of calming influence that helps them “slow down the mechanism” and keep them from rushing. Whatever those words are doesn’t matter, just as long as they’re important to the player. 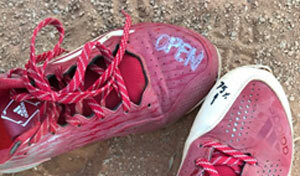 Then, have each player write those words, or short abbreviations of them, either on their shoes (like you can see in the photo of 2 different pitcher’s shoes), on their signal wrist-band, on their gloves or in the dirt (won’t work too good for outfielders). Have some different colored sharpies available so whatever color glove or shoe or wristband your players have they’ll be able to see their words. This is a very powerful way for players to remind themselves how to stay their best selves during games, and to help feel in charge of their own skill. I know a kid who wrote “next” on the left and “play” on the right. Once you make a mistake, the ball will always find you again so you need to flush the last play and be ready. I know that kid too Mike!! GREAT kid, btw. Great idea! I’m going to do this with my girls. Thanks for the tidbit!!! Fantastic idea!! Thinking of our catch phrase for out 10U pitcher now. She wants something on her hand or glove.